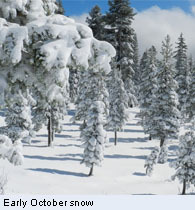 Last week we got some much needed snow, and more is on the way this week. 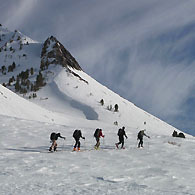 The ASI AIARE Avalanche Level 1 has become the cornerstone of the winter program. Much more than just an avalanche course, the curriculum that now has evolved for over 30 years ties together many aspects of backcountry travel and related skills to help your well being in avalanche terrain. Ski Splitboarding Mountaineering Guides. They are passionate about the snow and your learning of the snow craft. All the knowledge comes back to practical, "real time" application of when we are out there in the snow. Signup early, they all fill-up fast! December is an excellent time to get your education in. It doesn't take much snow to run a great course. Then, you're set for the rest of the season, when the free-riding really gets good. Already Done an Avalanche Level 1? Consider our 1-Day REFRESH. Pickup the latest upgrades of information. Practice your application of the variation of the Level 1 skills. Remember, they take years to master. The snow changes all the time. This course can be taken on it's own with no previous avy course. It is a great addition to the Avalanche Level 1 course and is a prerequiste for the Avalanche Level 2 course. Ready For Avalanche Level 2 This Year? You've been in the snow since your Level 1. You know there's more as part of your continuing education. Maybe it's time for Level 2. 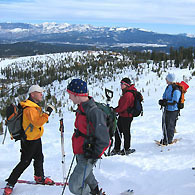 The AIARE Level 2 program is another 3 day program, that provides backcountry travelers the opportunity to advance their avalanche knowledge and decision making skills. We have combined the courses this year, so you can come on Alpine touring, telemark or spiltboard! We love to ski the backcountry! This is the ASI workhorse course to get you away from the lifts and into the backcountry. This one-day seminar is perfect for alpine skiers & rider who want to learn to use convertible touring bindings or spiltboard and telemark skiers ready to ski the backcountry. We look forward to climbing and skiing with you and helping you achieve your mountain dreams. If you can't find the answer to a question on our website, don't hesitate to give us a call. Mimi Vadasz and the ASI Crew! Operating on a non-discriminating basis under Special Use Permit, Inyo National Forest, Tahoe National Forest, Shasta/Trinity National Forests, Eldorado National Forest, Sequoia/Kings Canyon National Parks.